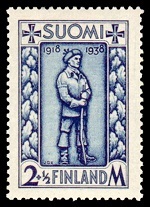 The charity stamps of Finland continued through the period from 1935 to 1940. These are regular definitive and commemorative postage stamps, but they have a "value added tax" or "surtax" on them, designed to raise money for national organizations, public events, and public charities. The three surtaxed charity stamps shown above (Sc. #B18-B20) were issued on January 1, 1935. 1.25 M. + 15 P. - Matthias Calonius (1738-1817). Born in Turku, he was Finland's most renowned jurist. He was a member of the Supreme Court of Sweden and later the Chancellor of Justice for the Grand Duchy of Finland. 2.00 M. + 20 P. - Henrik C. Porthan (1739-1804). Born in Viitasaari, he was a Finnish historian, writer, and a professor at the Turku Academy. 2.50 M. + 25 P. - Anders Chydenius (1729-1803). Born in Sotkamo, he was a Finnish priest and a member of the Swedish Parliament. The three surtaxed charity stamps of Finland shown above (Sc. #B21-B23) were issued on January 1, 1936. 1.25 M. + 15 P. - Count Robert Henrik Rehbinder (1777-1841). Born in Paimio, he was the Secretary of State for the Grand Duchy of Finland. 2.00 M. + 20 P. - Count Gustaf Mauritz Armfelt (1757-1814). Born in Tarvasjoki, he was a courtier and diplomat, playing a major part in the autonomy of the Grand Duchy of Finland. 2.50 M. + 25 P. - Count Arvid Bernhard Horn (1664-1742). Born in Vuorentaka Manor near Halikko, he was a Swedish-Finnish military officer, diplomat, and politician. The three surtaxed charity stamps of Finland shown above (Sc. #B24-B26) were issued on January 1, 1937. 1.25 M. + 15 P. - Frigate "Uusimaa" (1772). 2.00 M. + 20 P. - Frigate "Turunmaa" (1771). 3.50 M. + 35 P. - Frigate "Hameenmaa" (1789). 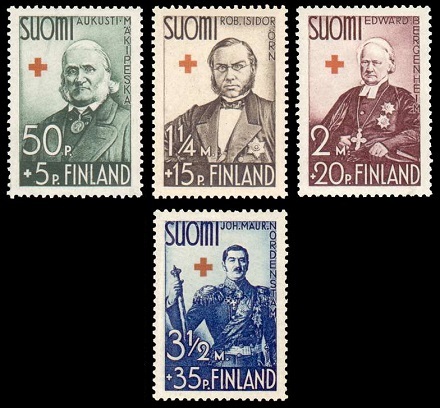 The four surtaxed charity stamps of Finland shown above (Sc. #B27-B30) were issued on January 5, 1938. 0.50 M. + 05 P. - Aukusti Mäkipeska (1812-1887). He was a champion of civil rights in the Grand Duchy of Finland. 1.25 M. + 15 P. - Robert Isidor Örn (1824-1885). He was the Mayor of Vyborg (1855-1865) and the Vice Chairman of the Senate Judiciary Department (1874-1877). 2.00 M. + 20 P. - Edward Bergenheim (1798-1884). He was the Archbishop of Turku from 1850 to 1884. 3.50 M. + 35 P. - Baron Johan Mauritz Nordenstam (1802-1882). He was a Finnish nobleman, military officer, and politician. 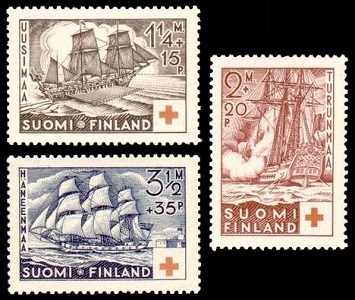 The three surtaxed charity stamps of Finland shown above (Sc. #B31-B33) were issued on January 18, 1938 to publicize the Ski Championships held at Lahti. The three sport-themed designs feature skiers. 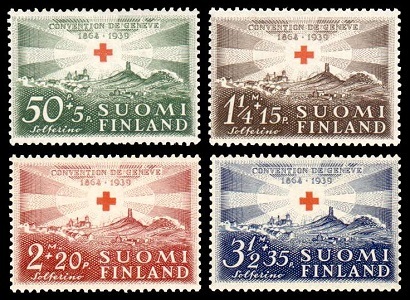 The four surtaxed charity stamps of Finland shown above (Sc. #B35-B38) were issued on January 2, 1939 to commemorate the 75th Anniversary of the Geneva Convention of 1864 and to honor the International Red Cross. The common design features a red cross and the Battlefield of Solferino, along with the inscription "CONVENTION DE GENEVE / 1864 / 1939". The Geneva Conventions were a series of international treaties, beginning in 1864, setting the guidelines for the humane treatment of non-combatants during times of war. This includes wounded or sick soldiers on the battlefield, prisoners of war, and civilian casualties of war. Henri Dunant, a Swiss businessman, visited the Battlefield of Solferino, shortly after the battle had ended, during a visit to Italy in 1859. The horrors he witnessed and the lack of facilities and medical aid for the wounded soldiers prompted him to write a book called "A Memory of Solerfino" in 1862. He later proposed the creation of a permanent relief agency for humanitarian aid in times of war, and it resulted in the creation of the International Committee of the Red Cross in 1863. 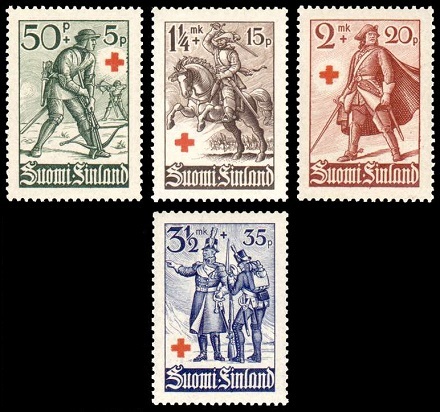 The four surtaxed charity stamps shown above (Sc. #B39-B42) were issued on January 3, 1940. The wartime-themed designs feature a red cross and the following. 0.50 M. + 05 P. - Soldiers with crossbows. 1.25 M. + 15 P. - Calvaryman. 2.00 M. + 20 P. - Soldier of King Charles III of Sweden. 3.50 M. + 35 P. - Soldiers of the War with Russia (1808-1809). The 2 M. + 50 P. denomination surtaxed charity stamp shown above (Sc. #B34) was issued on May 16, 1938 to celebrate the 20th Anniversary of the Victory of the White Army over the Red Guards. The surtax benefited the members of the Union of the Finnish Front. The 2 M. + 2 M. denomination surtaxed charity stamp shown above (Sc. #B43) was issued on February 15, 1940. 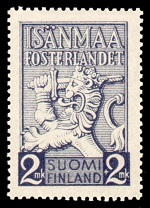 The stamp is inscribed "ISÄNMAA / FOSTERLANDET" meaning "FATHERLAND" in Finnish and Swedish. The surtax was given to a fund for the Preservation of Neutrality.